Louisville Inventory Crunch - I need homes to sell! To put it as bluntly as possible, I need homes to sell! This past winter the Greater Louisville Association of Realtors switched our computerized database to a new system. In the long run it is going to be a good thing, but in the short term we've had a few growing pains. Today though, I found a stats module that I don't remember having access to before. Take a look at the active and new listing charts. See all of those negative numbers? That indicates a decline from LAST YEAR. Last year the market wasn't as strong as it is this year. So we have a better economy AND fewer homes. If you are considering selling your home, you can find out what your current market value is - FOR FREE by visiting Louisville Home Value Report. 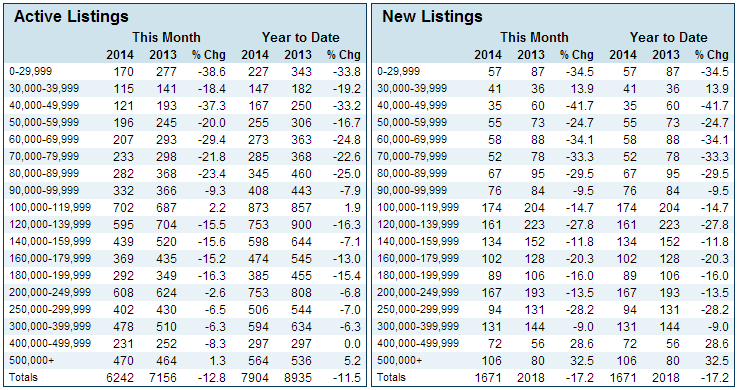 For homes between 180K and 200K there is over a 15% decrease in the number of available homes for sale. Possibly because of the weather, there are 16% fewer homes being put on the market in this month in comparison to last month. If you have been thinking about selling, but have told yourself you want to wait until spring, STOP! Due to an inventory crunch, your home will have less competition and could yield a higher sales price. Review the chart, the numbers speak for themselves. Lets talk. Call me 502-376-4225 -- or visit www.louisvillehomevaluereport.com and sign up there. I'll run a report on your home to give you an overview of sales and value in your specific area.